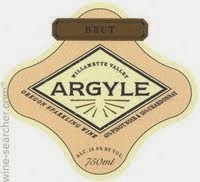 Argyle has a strong track record of producing high quality sparkling wine. This is a vintage Brut from 2007 that’s drinking beautifully right now. Made from Chardonnay and Pinot Noir grapes, it shows a nice fruity profile that’s bright, lively, and with substance. For an all-American bubbly, in this case from Oregon, you can’t go wrong here. Well made, priced around $20, and vintage- it’s easy to recommend. Raise a glass! –A Review from The Wine Cask Blog.